Experience traditional Sicilian art, cuisine and culture with our centralized location for: Mt. Etna, the ocean, authentic markets and much more! Catania is the easiest point to access to all Sicily has to offer. 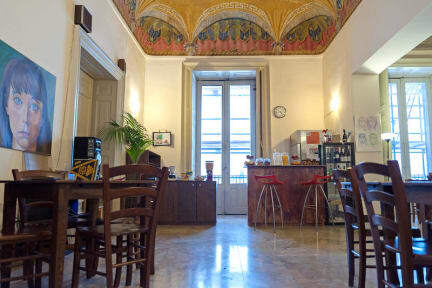 The hostel takes place in the art and music rooms of a palace that dates back to the 1600s. The baroque architecture style will amaze you as the delicious food from our kitchen fills your stomach. Our hostel offers complimentary breakfast, WiFi, luggage storage, maps and lockers. There is also a large common area for socializing complete with a bar. In our shop, we sell toiletries, guides and international fair trade products. In our common kitchen you can cook the amazing Sicilian food. The dorm rooms are adorned with stunning frescos as well as private balconies to view the beautiful Piazzas on each side of us. The rooms are spacious with a lot of natural lighting and are furnished with desks, end tables, chairs and lockers. Our beds have individual curtains for your privacy. Our gorgeous roof top terrace offers a panoramic view of Catania's historic center as well as Mt. Etna and other UNESCO sights. Our young and local staff are here to help you experience what Catania has to offer! Cancellations must be made by 10,30 am the previous day. Our reception is open 24/7. If you arrive during the night please contact us. We really enjoyed our time here! The staff was nice and very helpful. They gave great advice about things to do in Catania. The facilities were very clean and I never had a problem waiting for a shower/bathroom, but I should also note that we were there off-season and the hostel was not at full capacity. Still, would recommend 100%! The location is great and they have the best free hostel breakfast I've ever had. It was a bit quiet but I think March is still low season in Sicily. I stayed for 2 nights during St. Agata, the staffs were busy around as the hostel is located in restricted area but they are still very patient to answer questions and provide information. I had a good time in Catania. Thank you, Ostello degli Elefanti. nice hostel, but maintenance of toilets/showers/door closing systems/ etc. is really necessary. I stayed during The Festa di Sant’agata and it was very loud. Thousands of people outside and I didn’t sleep much. The rooms are alright.. not very homey and the beds aren’t comfortable. The breakfast is small but decent. It’s worth the money, as it is in a great location but I wasn’t overly impressed.